A medical condition is confirmed only after proper diagnosis, which involves checking the various symptoms and positive results of the medical tests. COPD diagnosis code is a unique set of medical diagnosis procedures that help the medical professional to identify the illness. The procedures followed to determine the disease are critically important to the medical world and the patient – in the first case for research and reference and in the second case for medical bills and claims. COPD diagnosis Code 490 is specifically concerned with bronchitis, which is not chronic or acute. COPD diagnosis Code 491 refers to chronic bronchitis, which is again further divided from 491.0 to 491.9. These refer to ordinary persistent bronchitis, constant bronchitis with mucus, chronic and obstructive bronchitis (with or without exacerbation and acute bronchitis), other acute stages and unspecified chronic bronchitis. COPD diagnosis Code 492 specifically refers to a condition known as emphysema. This subcategory of COPD identifies enlargement of airspace inside the lungs, diminishing of the alveolar walls, enlargement of the air sacs within the lungs causing pulmonary emphysema, complete destruction of the alveolar walls and COPD condition when the alveoli is considerably reduced causing obstruction to transfer of oxygen and carbon dioxide to and from the lungs (the basic breathing exercise). COPD diagnosis Code 493 refers to asthma, which can be unspecified, extrinsic, with or without exacerbation, exercise induced bronchospasm, and asthma with cough. COPD diagnosis Code 494 refers to Bronchiectasis. This is a “persistent abnormal dilation of the bronchi” with or without acute exacerbation. COPD diagnosis Code 495 refers to a condition known as extrinsic allergic alveolitis. The allergy results from the inhalation of organic dust particles causing hyperactivity in the alveolar and may even produce precipitins. 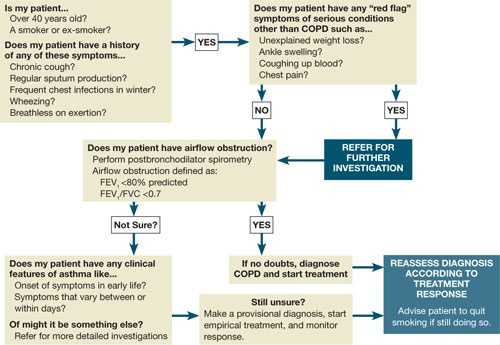 COPD diagnosis Code 496 refers to the final COPD. This is an irreversible condition of the lungs where airflow is obstructed while breathing out and oxygen inhalation becomes less. COPD is the third leading cause of death in theUSA and is mainly caused by smoking, according to medical research. Chest x-ray easily shows up emphysema and eliminates any other lung problem. A CTscan shows the emphysema stage and whether the patient can benefit from a COPD surgery. Lab tests like arterial blood gas analysis and sputum examination can determine the amount of oxygen in the blood system and the sputum test can identify the lung problem, thus helping in ruling out lung cancer. The pulmonary function test is the spirometery test, which measures the amount of air that the patient blows out into the tube. The spirometer connected to the tube measures the capacity of the lungs and can help detect COPD even before the symptoms set in.